Students enrolled in this program earn a Bachelor of Arts in Hotel Management. The program is designed to assist the student in his or her preparation for a rewarding career in the management of hospitality operations. To develop students’ critical thinking and to refine their analytical, problem-solving and decision-making skills. To develop the managerial skills, abilities and competencies essential to all professional managers, with specific characteristics needed for managing hotels, restaurants and related operations. To provide the diversified knowledge and broad and varied professional background required in the management and operation of the modern hotel. To provide a broad understanding of the fundamental principles of the basic areas of business relating to the fundamentals of management within the hospitality industry. To offer training within the hospitality industry providing students with the opportunity to integrate their academic skills with substantive work experience. To instruct individuals in marketing and sales promotion strategies applicable to a wide variety of hospitality industry settings. To provide students the academic, technical and intellectual background that would enable them to pursue higher studies in high-quality graduate and professional schools. 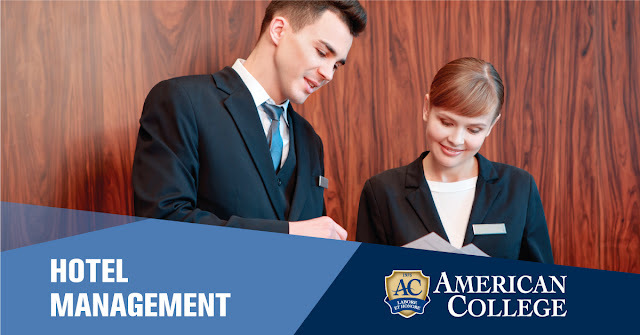 Apply the major concepts, skills and values of a hotel and lodging industry to address problems and critically analyze and evaluate contemporary issues within the areas of hotel management. Apply managerial skills, leadership abilities and competencies in the management of hospitality operations and human resources. Use marketing and sales promotion strategies applicable to a whole variety of hospitality industry settings. Recognize the scope and significance of outstanding guest service quality and its impact on the success of any hospitality operation. Apply financial reasoning and performance analysis to evaluate issues in the hotel industry. Acquire supervisory and managerial level training experience within the hospitality industry. Seek employment at senior level management positions or pursue further studies in related fields. The student is free to take any course offered by the College. During summer vacation periods (1 June to 30 September) Hotel Management students have the opportunity to undertake training in the thriving hotel and tourism industry in Cyprus, thus supplementing their education with real hands-on, paid experience.